Dotted along the Sitges coastline, between the parish church and the Terramar hotel are nine of the most beautiful beaches you will find in Spain. All of these beaches offer sun loungers for rent, showers and little huts selling refreshments. There are 3 gay beaches, but be aware that most beaches are mixed. Most of the surfing takes place beyond the Calipolis Hotel, closer to the Terramar end of Sitges… as San Sebastian Beach currently resembles a building site to make way for the promenade that will connect the nudist beach area of Balmins to the heart of the town! There is another famous surfing beach, called "Marina Aiguadolç Beach", you will come across this small beach before arriving in Sitges on the Garraf coastal road from Barcelona. It has a marina of the same name: Aiguadolç. P.S. : The Big Kahuna Store offers everything you need in Sitges to go surfing and is located at the end of Calle Jesus. 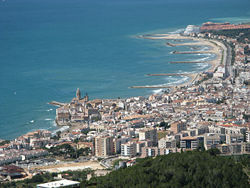 I spent a fortnight in Sitges in May/June 2008. During this time I had the chance to go surfing about 4 times, which is great, as Sitges is one of the very rare spots wehere you can actually surf in the Mediterranean Sea!